Symmetry-breaking constraints in the form of inequalities between variables have been proposed for a few kind of solution symmetries in numeric CSPs. We show that, for the variable symmetries among those, the proposed inequalities are but a specific case of a relaxation of the well-known LEX constraints extensively used for discrete CSPs. We discuss the merits of this relaxation and present experimental evidences of its practical interest. Goldsztejn, A. [et al.]. 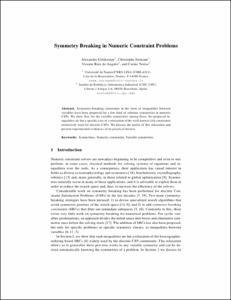 Symmetry breaking in numeric constraint problems. A: International Conference on Principles and Practice of Constraint Programming. "Principles and practice of constraint programming (CP 2011): 17th International conference, CP 2011: Perugia, Italy, September 12-16, 2011: proceedings". Perugia: Springer, 2011, p. 317-324.